Archives for October 2017 | Dental Practices Services, Inc. Preparing to roll out an in-office plan for your practice takes a tremendous amount of time and effort. Many dentists fail to recognize the value and opportunity that an in-office plan can bring to the practice. 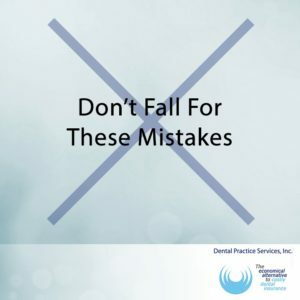 Here are three common pitfalls many dentists experience when developing a new in-office benefit plan without the proper guidance and assistance. A common mistake when starting an in-office plan is a lack of proper and comprehensive team training. Your team needs to be on the same page as you regarding the particulars of your plan. After all, it will be your front office staff fielding questions from patients and phone calls from prospective patients. Don’t forget to properly equip your hygienists with the right information as well. Hygienists play a crucial role in laying the groundwork for future treatments. For many patients, cost is the first thing they consider when thinking about dental care. Train your hygienists to discuss the benefits of an in-office plan before the patient can reject the suggestion of treatment. When some practices choose to “go it alone” to set up an in-office benefit plan, they neglect to do the proper research. How will you determine your plan’s fee structure? Consider incentive pricing carefully, both to ensure it adequately covers your own costs and that it is something that will be attractive to patients. Look at your competition. Competitors play an important role in helping you establish your own pricing, as well as market position. You finally have your plan up and running and you find yourself asking, “Now what?” Your plan isn’t going to be successful on its own. Develop a marketing strategy to increase awareness of your new plan. Create marketing materials to target new patients, but don’t forget to market to your existing patients as well. Your new plan should be a vehicle to drive new patient numbers up, as well as increase the case acceptance rate among your current patients. Your marketing materials need to carefully and thoughtfully convey this. Setting up a new in-office dental plan can be a hassle. Rather than fall victim to common mistakes such as poor team training, incorrect pricing, and ineffective marketing, work with a team that can guide you through the process. At Dental Practice Services, Inc.™, our team has helped dentists establish an effective alternative to costly dental insurance. Our Private Dental Plan™ can help you grow your practice through increased revenue and new patient numbers. Contact us for a consultation to see how the Private Dental Plan™ can transform your practice.